The Magnolia Company Improved Large Meyer Lemon Birthday Gift Tree, 24 - 26" tall. Imagine having an improved lemon that is sweeter than traditional lemons purchased in the store! Sometimes the lemons that in the stores are very tart. This improved Meyer Lemon tree produces the most delicious lemon more delicate in flavor than other varieties. With this Myer Lemon tree it is easy to pick your own fruit off of your tree. Imagine again having this Sweet Myer Lemon tree where you can pick your own lemons for any culinary pursuit including making your own personal batch of freshly-squeezed, ice-cold, lemonade. That is the most fun ever! And, if you have children or grandchildren making lemonade together straight off of your meyer lemon tree will be a memory they will always cherish and never forget! This Myer Lemon is a cross between a Mandarin orange and a traditional lemon which makes it extremely sweet. Many foodies us this Myer Lemon to add a special touch to their culinary dishes making it the most talked about lemon in the kitchen! It is a hardy outdoor landscape item through zone 9 however it can be grown throughout the country by potting it up into a larger container and growing it outdoors in the early spring and bringing indoors during the cold winter weather. It will still produce an abundance of lemons ....even in the container! It is actually an extremely attractive containerized patio and house plant. In those spaces you will be greeted by an intoxicating aroma of sweet smelling lemon blossoms followed with a heavy fruit set of the most delicious lemon you have ever taste! A BEAUTIFUL HAPPY BIRTHDAY GIFT TREE - RIGHT OUT OF THE BOX! 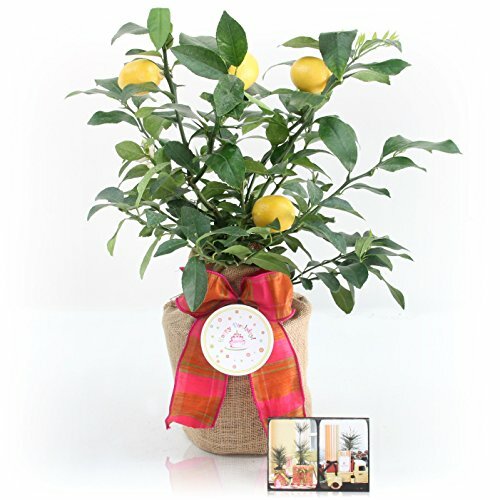 This healthy Myer Lemon Gift Tree is the perfect gift for a welcoming housewarming gift or any gift occasion. Gift occasions like new baby, housewarming, birthday or get well - this tree gift will be enjoyed as a special gift. THIS THRIVING MYER LEMON TREE GIFT Grows into a mature tree about 10' tall with a 7' Spread. The sweet fragrant blossms set from February to April and produce a heavy fruit set. It is very common to get sweet myer lemons in your FIRST YEAR. As the tree matures it will set a large quantity of lemons. THE MAGNOLIA COMPANY HOUSEWARMING TREE GIFTS are a symbol of welcome and hospitality for a new home! CUSTOMIZED OPTIONS ARE AVAILABLE FOR A UNIQUE GIFT MESSAGE and EVEN AN ENGRAVED TREE TAG. Review these gift tree options to make this the perfect gift for your family and friends. If you have any questions about this product by The Magnolia Company, contact us by completing and submitting the form below. If you are looking for a specif part number, please include it with your message.